Just listed in Palm Beach Gardens in the very exclusive subdivision of Mariposa within Mirasol rests this 4BR/5.5BA custom-built estate. Casually elegant and impeccably designed, this Mariposa Mirasol home offers fresh paint and decorative upgrades throughout its 4,996 square feet of living space. The spacious kitchen with center island offers a number of deluxe upgrades including granite countertops, stainless steel Kitchen Aid and Bosch appliances, and a beautiful tumbled marble backsplash. A private backyard offers the perfect relaxing retreat with its towering hedges, fantastic golf views, covered lanai, salt water pool and spa with waterfall. Additional features include plantation shutters in the family room and master suite, media room with screen and projector, neutral marble floors and new carpeting throughout. This Mariposa Marisol home also boasts an enviable location within walking distance to the impressive 50,000 square foot Grand Clubhouse. 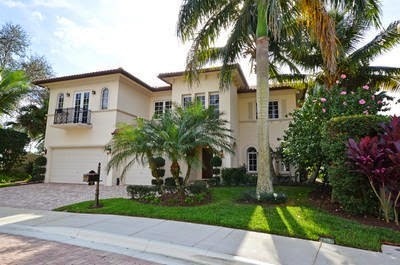 102 Via Mariposa is located in Palm Beach Gardens and is currently asking $1,399,000. This Mirasol listing is courtesy of Leibowitz Realty Group, Inc./pbg MLS# RX-10101257. Located in the heart of Palm Beach Gardens, Mariposa Mirasol is located just moments from the world class shopping and dining available at nearby Downtown at the Gardens, PGA Commons, and Gardens Mall. The pristine beaches of Jupiter and Juno Beach are also just minutes away. Close proximity to Florida's Turnpike and I-95 also offers residents of Mariposa Mirasol easy access to all the best beaches, shopping, dining and entertainment the Palm Beaches have to offer.